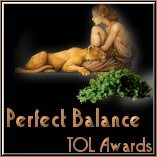 Thank you for applying for the TOL (Touch Of Love) Awards. Should at anytime as part of the condition of having these awards/rating, should your site become unsafe for any reason you will be asked to remove it immediately. From what I have seen from your site I don't think that will ever happen. It was real pleasure visiting your fine site! I will stop frequently to see new additions to your interesting page! Thank you for applying for an Optical Resolution award. We have reviewed your application, and are pleased to inform you that your site has won the Optical Resolution Graphics Excellence award. Your site has been added to our winners database, and will be permanently displayed in the "Graphics Excellence" category of our winners directory. In addition, your site will show in our "latest additions" section for the next 30 days. Thank you for applying to our award. The evaluation of "Barbara Tampieri Home Page" is finished and we are pleased to present you the Crawling Chaos Award with two stars. The elegant and clean presentation of the different galleries with their high quality graphics make your site become a real highlight in this site-genre. The "Movie Stars Postcard Collection" is another impressive area of your homepage. I really enjoyed my stay! Keep up your nice work. We did surf your creative, informative and perfect designed place and checked both, your textual and visual content as well as your navigation. But most importantly we had the overall impression that the motivation for creating your site is rooted in kindness, dedication and the wish of sharing and to inspire. This attitude is a very precious one and shows your ambition to make the net a more human and friendlier place. Beside beauty, content, originality, and individuality we mainly try to catch the spirit of a site and yours has heart, brain and soul! CONGRATULATIONS!!! 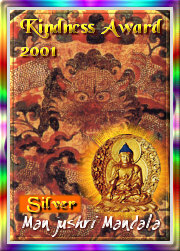 you are a kind and open-minded net-citizen and we like to offer you our "Manjushri Mandala Kindness Award 2001 in SILVER". May the Tibetan dragon king (druk dru) and the Golden Buddha grant you continued creativity, wisdom, positive energy, insights and success. And may they act as powerful reminders to keep the spirit of kindness alive. As part of the requirements should at anytime your site become unsafe for any reason you will be asked to remove it immediately. Your site Barbara Tampieri Home Page has won the Decadent Vision Award. You have an outstanding site, professionally designed with easy to follow navigation. Your site has a good contrast in color of text to background and asthetically pleasing graphic designs which are quick loading on all speeds. You have obviously spent endless hours accumulating resources to share with guest to your website. Your dedication to making your website the valuable resource it is shows in every page. Good Job! I am writing to inform you that your website has won the Rajuna's Refuge Mystical Arts Award. Your site, Barbara Tampieri Home Page has a wonderful aesthetic feel to it. Navigation, download time, use of space, are well done. You showcase your wonderful art and awards within a beautifully designed web environment. Your site earned a score of: 10 out of 10 on the award criteria. I�ve often visited Your website and each visit was a pleasure for me. Your presentation of fine arts is marvellous and Your idea of giving artists a place to present their work is famous. Your photographs are beautiful and the idea with the puzzle is great. Your award section is well above the standard. So it is finally to say, that it is a honor for me to present You the Museumsaward. For the future I wish You the very best. I am very pleased to announce you that your website "Barbara Tampieri Home Page" has been awarded the Gold Seal of the "The High in The Sky Award". Your site, for the nature of its artistic content and for the outstanding quality of the design and implementation, presents an undeniable excellence that puts it well above the remaining ones, making it worthy of being publicly designated as an example to be followed and as a true cultural and knowledge source. If I may say so, it is indeed a feast for the eye and spirit. My sincere congratulations for your quite remarkable work. My best regards and, once again, congratulations on such an excellent site! After reviewing your site, we decided to qualify with our Geetha's Great Design Award. Your site has excellent design, original graphics, very easy to navigate and well presented, organized content. We really enjoyed your art gallery and card section.